To submit an event for inclusion in this Event List, please follow the directions on the 'Submit An Event' page. June 7, 2019, 12:00 p.m.
For our first concert of the 2019 season we are excited to welcome Aaron Mathews. Mathews is the music director at St. Charles in Hartland, where he coordinates and directs the Adult Choir, Children’s Choir, Handbell Choir, and Resurrection Choir. He also plays piano for daily and weekend Masses. He earned a Bachelor of Arts in Piano Performance from Morehouse College, a Master of Music in Piano Pedagogy from Georgia State University, and a Doctor of Musical Arts in Piano Pedagogy from the University of South Carolina. He has served on the music faculty of Allen University and Viterbo University and has directed adult and youth choirs in both Catholic and protestant congregations. Works by Mathias, Bach, Franck, Buxtehude, Walther, Barber, and more! 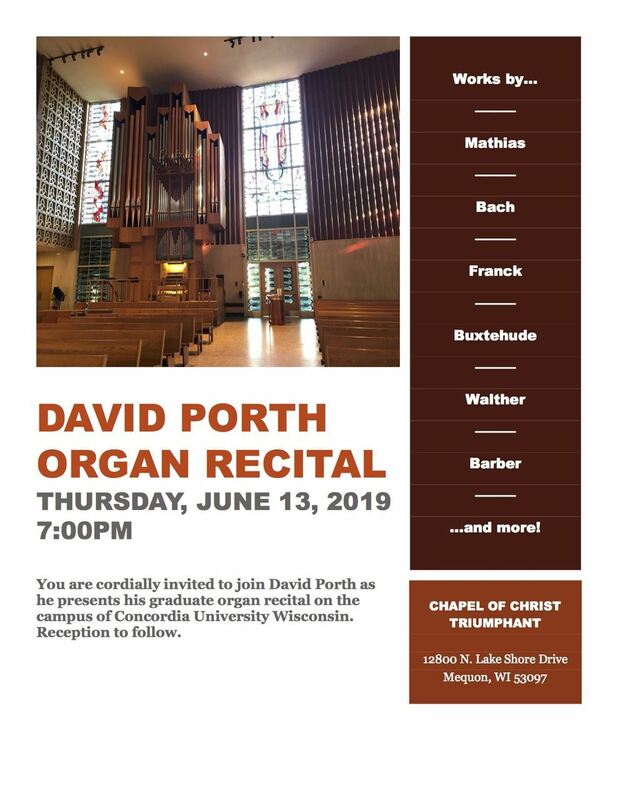 June 14, 2019, 12:00 p.m.
Organist David Bohn will be joining us at the Berghaus this Friday. We are excited to welcome him as we kickoff the American Guild of Organists regional conference held throughout the Greater Milwaukee area this weekend. A native of Wisconsin, David Bohn received degrees in composition from the University of Wisconsin, University of Wisconsin-Milwaukee, and the University of Illinois. His primary composition teachers were Joel Naumann, Yehuda Yannay, and William Brooks. He currently resides in West Allis, Wisconsin, and is organist and choir director St. John's Evangelical Lutheran Church in West Milwaukee. He is President of the Wisconsin Alliance for Composers, Vice President of the Wisconsin Chapter of the Organ Historical Society, and on the boards of the Milwaukee Chapter of the Organ Historical Society and the American Guild of Organists -- Milwaukee Chapter. He also edits the newsletter for the Wisconsin OHS. colors and sounds this wonderful instrument has to offer. compositions have been published by GIA. August 2, 2019, 12:00 p.m.
Organist Tim Handle will by performing music written by soldiers on the other side of the wars. Ernst Brockmann was a young man who served in the German army during the First World War. His music was rediscovered by British musicians Patricia Hammond and Matt Redman. When she researched the music she came across and was able to contact his nephew, Paul Brockmann, who is now 96 years old. Paul was conscripted into the German army, losing both legs during the German offensive into Russia during the 2nd World War. Both Ernst and Paul composed for the organ, and more than anything simply wanted to write and perform music. Ernst Brockmann was a very talented young man, on track to becoming a cathedral organist and composer when he was drafted into service instead of enrolling into music school. While sitting in the trenches on the front line he would write in his journal, “If I could just sit at a big organ! Melodies, melodies, and harmonies; unknown, unimaginable, whiz through my head! I have vowed God to devote my power to religious, serious music." August 9, 2019, 12:00 p.m.
We are pleased to welcome back organist Sheri Masiakowski to our Berghaus organ bench again this season. She will be joined by flautist Donna Hryniewicki and bassoonist Dave Pierce. August 16, 2019, 12:00 p.m.
We are pleased to welcome back Michael Keegan on both horn and organ; and Mary Radspinner on Harp. 07 May 2017 3 PM - Choral Scholarship Fund Raiser Concert The Sepulcher – A Liturgical Easter Play 3:00 p.m.
12 Sep 2015 9:00am -- Dr. John Behnke "Discovering New Repertoire and Improving Techniques"
26 Apr 2015 2:30pm-- Milwaukee Chamber Choir "Taking Flight"
16 Apr 2015 12:15pm-- "Mostly Mendelssohn"
14 Apr 2015 7pm--"Lutheran Symbolism in the Music of JS Bach"
08 Nov 2014 7:30pm -- Quicksilver Baroque, "The Invention of Chamber Music"
30 Mar 2014 3pm -- Hymn Festival -- "The Seven Days of Creation"
01 Mar 2014 The Art of Choral Singing - A Choral Workshop - So You Think You Can Sing? 20 Jan 2013 Bel Canto Chorus Tribute to Dr. Martin Luther King, Jr.
23 Oct 2012 6 pm - Milwaukee Children's Choir "Meet Marco"
04 Mar 2012 3 pm - Bel Canto Chorus, "Evensong"
18 Feb 2012 7:30 pm Milwaukee Choral Artists - "Southern Skies and Western Winds"
09 Jan 2012 Local concert selections on Pipedreams! 12 Jun 2011 3pm -- Mark Fideldy in recital to honor PrideFest and "Reconciling Ministries"